In general, my group's research interests are engineered management solutions to water quality problems in natural systems. Most of our projects involve applied environmental aquatic chemistry, sediment biogeochemistry, and biological and chemical processes related to contaminant transport and transformations. We typically try to complement field or laboratory investigations with mathematical modeling. Here in Duluth, we are involved with research related to sediment contaminants in the St. Louis River estuary (link to Dr. Johnson's work in the SLRE, below) (external link to MPCA website) as well as the environmental impacts of mining on NE Minnesota water resources (link to Dr. Johnson's work related to sulfate geochemistry, below) (external link to MPCA website, and DNR website). My research group is currently comprised of a full-time scientist, graduate, and undergraduate students. The overall goals of the project are to: 1) to determine if restoration efforts utilizing navigational with dredged material is an effective strategy for reducing contaminant bioavailability during restoration at moderately contaminated areas and 2) to develop a methodology for using passive sampling devices to quantify contaminant bioavailability that can be used to evaluate restoration at other sites in the Great Lakes. This project will utilize passive sampling techniques to quantify the effects of restoration efforts in the Duluth-Superior harbor in terms of (a) pre- and post- surficial sediment contaminant availability, (b) potential for contaminant transport through habitat creation material, and (c) implications of potential ongoing sources of contamination to surficial sediment in restoration areas. The extent to which total- and methyl- mercury flux from sediments in the St. Louis River Estuary contributes to water column and/or fish tissue concentrations is presently unknown. This study will make in-situ measurements of pore water and solid phase mercury and associated biogeochemical parameters and deploy chambers to quantify the flux of total- and methyl- mercury across the sediment-water interface. The proposed work is quantifying the bioavailability of PAHs in stormwater pond sediments and assess the extent to which the contaminants can accumulate in aquatic organisms. PAH availability is being assessed in three relevant locations related to stormwater ponds: (a) uptake to organisms in the sediments at the bottom of existing stormwater ponds, (b) release from soil particles to water during resuspension, and (c) uptake to organisms from sediments once they reach a downstream natural waterway. The study involves a combination of field sample collection and small-scale laboratory studies using stormwater ponds in the City of Duluth and St. Louis River Estuary as a pilot system. Our objectives of this project are to determine (1) the fates of sulfate and sulfide in wild rice beds in relation to litter accumulation and availabilities of nitrogen and other nutrients, and (2) the effects of sulfate and sulfide on wild rice production. Anoxic sediment typically has a large reserve of iron in various solid phase forms in addition to that present in pore waters. 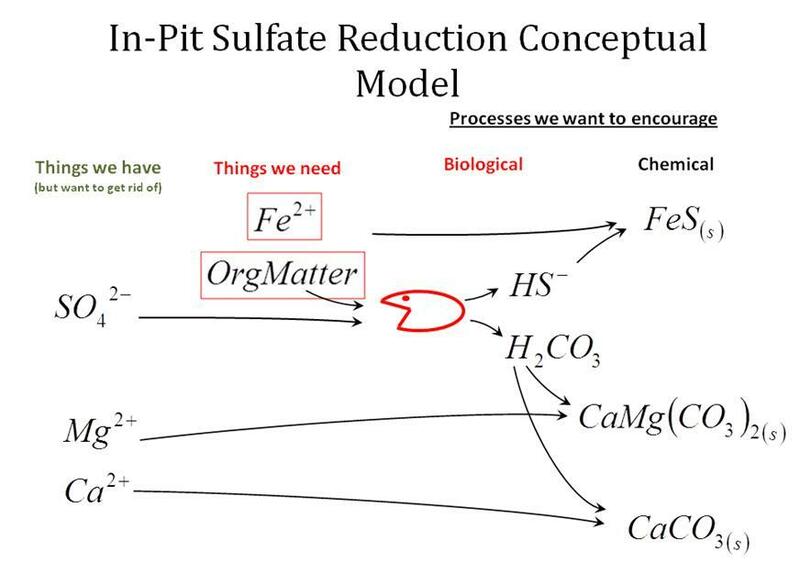 As sulfide is added to sediment as a result of biological sulfate reduction, the precipitation of insoluble iron sulfide can remove sulfide from pore waters until the readily available iron is depleted. This lab study is investigating methods for characterizing the capacity of sediment to remove added sulfide from pore waters. In order to evaluate the mechanisms of methylmercury production and release from wetlands and lakes receiving sulfate from mining on the Mesabi Iron Range, this project is undertaking an in-depth characterization of methylmercury production and the related geochemical setting at four sites (two lakes and two wetlands) in mining-impacted watersheds. Replicate sediment cores, pore water samples, and surface water samples will be collected from each lake/wetland site at various times throughout the summer and analyzed for a host of parameters including methyl mercury (total and dissolved), mercury methylation rate, sulfate, sulfide, iron, pH, and DOC. In order to help understand whether sulfide builds up in the pore waters of sediment underlying a water column with elevated sulfate concentrations, porewater measurements of iron, sulfide, sulfate, and pH are being taken with high depth resolution (1.5cm) in sulfate amended wild rice microcosms (John Pastor). Measurements will be made at three key stages in wild rice growth (floating leaf stage, budding stage, cenessance) in the summers of 2012 and 2013. Measurements in sulfate amended mesocosms will be compared to measurements at two field sites during the summer of 2013. The Minnesota sulfate standard includes language related to the timing of sulfate discharges to waters used for the production of wild rice. In order to understand the rates of sulfate diffusion and reaction in sediment, laboratory mesocosms from sites containing high and low organic carbon are being incubated at warm (21C) and cold (5C) temperatures while exposed to an elevated overlying water column sulfate concentration for a fixed length of time (~2months). Porewater and overlying water will be monitored to quantify the rates of diffusion into and out of sediment pore waters for sulfate and a tracer. A mathematical model will be developed and used to describe the rates of sulfate reaction and transport. Sophie is working on wild rice rooting zone geochemistry for the Sea Grant Project. Logan is working on the DNR methyl mercury production and transport project. Amanda is working on understanding the bioavailability of contaminants in sediments, with a focus on the use of passive sampling devices. Will is working on the temperature deperature dependency of sulfate diffusion and reaction in the context of the MPCA's sulfate standard review. Dan joined our group as a full-time researcher in Fall 2013. He is spending significant time on the Corps of Engineers-State of MN Bioavailability project and helping to manage the lab. Kyle has helped primarily with the mercury study in the St Louis River Estuary and several other ongiong projects. He also has worked in the lab on quantifying water chemistry samples for several analytes. Anna is helping Amanda with bioaccumulation and SPME pore water analysis of PAHs in sediments. She is also pursuing the use of microelectrodes to quantify fine-scale chemical gradients in the proximity of the sediment water interface, especially in the context of the Lake Superior seiche's effect on St. Louis Estuary sediments. Nick Osmundson (Undergraduate, Civil Engineering) Nick started by helping to organize a lab cleanup project, but has since been plugged into research related to the capacity for iron in sediments to remove sulfide. He is pursuing a method to quantify the "sulfide absorption capacity" of iron in sediments. Joe is working on measuring sulfide, iron, and pH in wild rice sediment with equilibrium "peeper" pore water samplers. He has taken the lead in data entry and validation. Ryan is assisting with the temperature dependent sulfate project as well as mesocosm and field porewater measurements. He assisted the biology department in quantifying fine-scale chemical gradients near the surface of corroding steel. Aaron led the the dredged material - biosolids leaching project. He also has helped with various sampling initiatives and metals analysis on ICP-MS. He is presently leading an effort to quantify the capacity of iron in sediments to absorb sulfide. 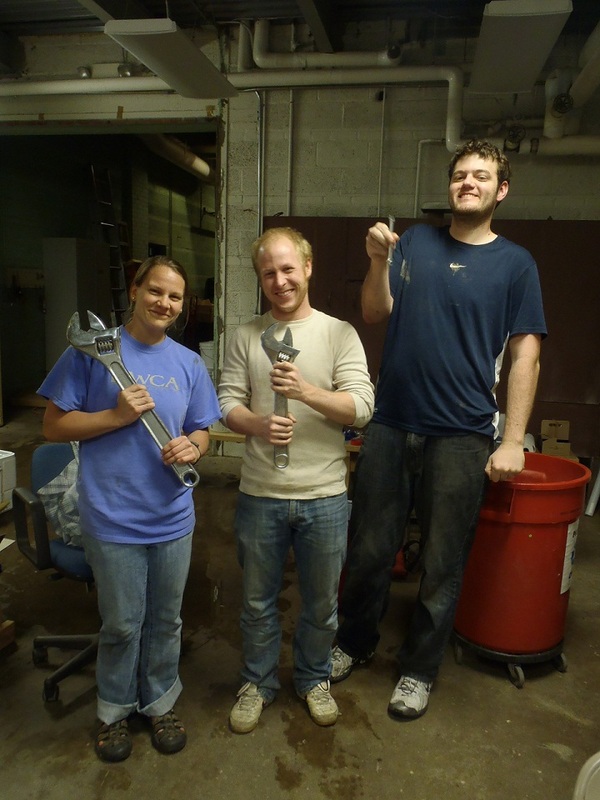 Yer helped fabricate lab equipment and with analysis of sediment samples for the Corps of Engineers - State of MN Bioavailability study. She also helped with field sampling and analysis for the 2013 MPCA wild rice Project. Alex spearheaded the massive effort to deploy peepers in mesocosms and field sites for the MPCA Wild Rice project in 2013 and subsequently helped Amanda with SPME analysis of PAHs in sediments. Brian completed his MS thesis on a project which investigated the influence of sulafte and carbon on methyl mercury in St. Louis River estuary sediment. Ben worked on the Pumped Hydro project, was involved in the design of the Dredged Fines/Biosolids projects, and prelimninary work on the St Louis Bioavailability study. He also developed several stormwater-related research ideas. Nathan worked on a short UROP project that used Solid Phase Microextraction (SPME) fibers to measure Polycyclic Aromatic Hydrocarbons (PAH). He later assisted with various projects. Max worked on a UROP project that used mushrooms to degrade Polycyclic Aromatic Hydrocarbon (PAHs) contaminants in aquatic sediment. Paul worked on the Pumped Hydro project but focused on the environmental impacts associated with mining. Following graduation in Spring 2011, he took a job at a local architectural firm and is considering graduate school in the future. Abdi worked on the Pumped Hydro project and focused on reviewing and synthesizing the environmental impacts associated with hydroelectric power. The objective of the proposed work is to assess the feasibility of using fine materials from dredging operations in conjunction with biosolids from WLSSD to formulate optimal nutrient content and physical properties for beneficial reuse applications. A review and analysis of existing information will be used to form the basis for the experimental investigation of three different potential applications. In addition to the specific experimental analyses, several different mixtures of dredged material/biosolids will be investigated during the summer months for their utility in the establishment of vegetation. This research project will test potential methods for removing sulfate from waters in abandoned mining pit lakes. These lakes represent a potentially important source of sulfate to the environment and have unique geochemical characteristics which make them different from other mining waters. The proposed work will evaluate the use of locally available carbon sources and different biological innocula for removing sulfate from mine waters. Preliminary laboratory experiments will be used with site-specific water to test sulfate reduction rates and the most promising carbon/innocula combinations will be tested in pilot-scale columns. The objective of this project is to investigate the role that sulfate plays in driving contaminant-related bacterial processes in the surficial sediment of the St. Louis Estuary. The results will help to determine the influence of mining-related sulfate loads on contaminant transformations in the sediment of the Estuary. Specifically, results will provide an estimate of the extent to which bacterial sulfate reduction contributes to mercury methylation in surficial sediment of the St. Louis River Estuary. Analysis of sediment cores will be used to assess the in-situ structure of active biological zones and their concomitant effect on mercury methylation. Bacterial sulfate reduction requires a source of sulfate, typically from the overlying water or groundwater inflow, but occurs only after more energetic electron acceptors, such as oxygen, nitrate, and iron, have been depleted. A typical structure of bacterial communities in aquatic sediment overlain with oxygenated water includes a layer of aerobic bacteria near the sediment-water interface and a stratified sequence of bacterial communities at increasing depths (Figure 1). Therefore, the location at which active sulfate reduction occurs is dependent upon factors other than total sulfate, including the availability of labile organic carbon and more favorably energetic electron acceptors. This study will provide an assessment of whether active sulfate reduction is occurring in the near surface sediment where contaminant transformations have the potential to impact the flux of contaminants to the overlying water. In addition to locating the zone of active sulfate reduction in sediment, this study will also provide a preliminary assessment of the importance of sulfate reduction in mercury methylation in sediment of the estuary. 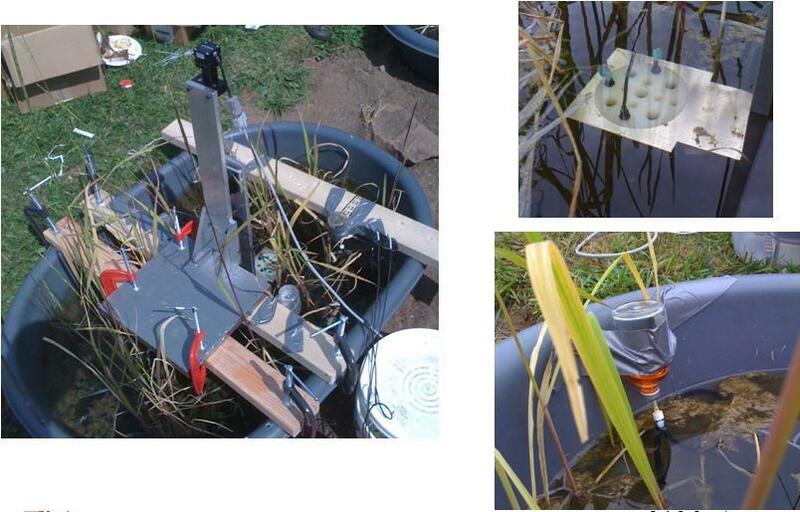 This study will include a critical review of porewater measurement techniques for characterizing important geochemistry related to the effects of sulfate on wild rice. Candidate methods will be chosen to evaluate and refine measurement techniques at 1-2 wild rice sites. Based on the literature review and preliminary studies, a recommendation will be made to guide more detailed subsequent studies related to the influence of sulfate-related porewater geochemistry on wild rice. This will include both methodological recommendations as well as guidance on sampling design to characterize within-site variability. This project involves an interdisciplinary team of researchers from several departments within the university as well as industry partners. Our specific role in the project is to put together a cursory or 'scoping-level' Environmental Impact Statement. Implementing PHES in NE Minnesota will likely involve the construction of new reservoirs or rapid fluctuations in the water levels of existing mine pits. We will work to answer questions such as: What are the likely impacts on the flow of water in local groundwater and surface waters? How might PHES affect drinking water supply, recreational use, habitat, etc.? What are the potential impacts on water quality within the system and external to it? What are the implications of PHES in terms of environmental permitting?